Our writer says kids parties are out of control and this new rule should be enforced immediately. The solution to the birthday party present-pile has finally been discovered and it’s this: fiver parties. If you’ve never heard of them then don’t worry, I am going to reveal all. If you’re the parent of a child under 10 then you almost certainly know the horror of organising a birthday party. No, not the horror of deciding whether to pay through the nose for a soft play centre or let 25 rampaging kids trash your home. And not the even trickier decision about whether to just invite their close friends and risk alienating the parents who invited you to their kid’s party and expect a reciprocal invite for little Jimmy (honestly, the whole thing is a minefield. It makes weddings seem simple). The really difficult decision is what to do about gifts. When your child is invited to a party you need to spend a minimum of £10 on a gift for the birthday boy or girl. I don’t know where £10 came from but I have asked all my parent friends and they all agree that it’s the polite amount to spend. The trouble is, for a tenner you can’t get anything particularly wonderful, so you end up buying a space-filler toy, something plastic that the recipient will get excited about for maybe five minutes and then leave in their toy box. As the parent throwing the party, it’s even worse. You end up carrying home two bin-liners of gifts and then unwrapping 24 £10 presents that your child will almost certainly never play with. You know they cost at least £240 combined. You know it’s wasted plastic, wasted money and wasted space in your home. Now read: does Facebook care about its scam epidemic? Oh, I hope it doesn’t. I am always grateful that anyone has chosen to spend money on my boys. But the kind of toys that last and are worth having cost more than a tenner. And when I am trying to teach my children life lessons about waste and self-control, watching them rip open 24 presents and then lose interest in the contents is heartbreaking. 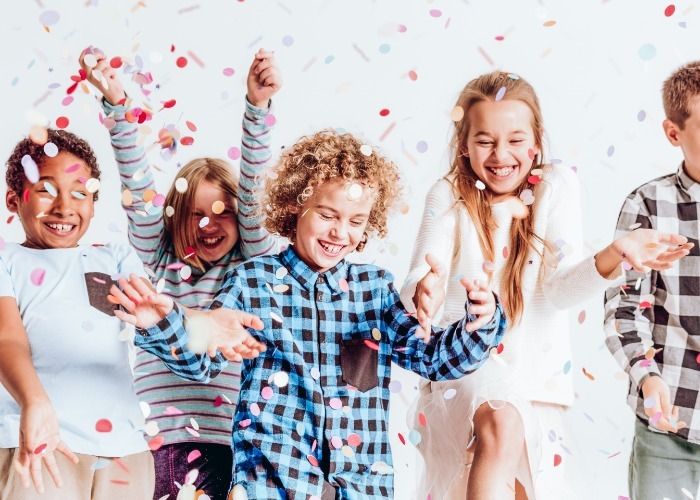 What’s more, it seems likely to me that some kids can’t attend classmate parties because the parents can’t routinely stump up the money for a gift – a gift that the child receiving it probably won’t care about for long. Then there’s the environmental impact of the wasted plastic, not to mention the impact on my home environment as it fills with cheap plastic toys. But can’t you just say ‘no thanks’? I tried that once. On every invite I carefully wrote a cheery ‘no presents needed, thanks’. It was a disaster. Half the parents ignored it and brought gifts anyway, which they then felt embarrassed about giving. The other half were embarrassed to see that some people had brought presents and kept apologising for not. Okay, can’t you regift them? I have tried that too. I have told my boys we will donate or regift the presents they don’t want but it’s really hard. Firstly, they want all their presents, even the ones they are never going to play with again. They are 7, 5 and 2 – the second you try to take something from them they want it more. Secondly, the ones I did manage to spirit away (feeling like the baddie from a Disney film for doing so) I never dared to regift. What if I accidentally gave it to the child who had given it to us? What if that child’s parents regifted it to the original gifter? What if someone found out? In short, it didn’t work. But then I read about fiver parties and now I know exactly what I will do for my next batch of birthday parties. Okay, what’s a fiver party? It seems to have originated in Australia but it’s something we should adopt globally immediately for the sake of our planet, our pockets and our patience. When sending out the party invites the parent makes a note that it’s a fiver party, meaning that instead of expensive presents, every child can just bring a card with a fiver in it. The parent warns the birthday child in advance that instead of a pile of presents, they are going to get some cash to buy one bigger present they really want. Parents of invited kids are happy because they save at least a fiver plus time looking for a gift and wrapping it. Parents of the birthday child are happy because they don’t have to deal with 24 Paw Patrol and Jurassic World-themed lumps of plastic. The birthday child is happy because they get a fistful of cash to buy something they genuinely want. Now read: who should teach kids about cash? Yes, a few. You occasionally see parents being laughed at on social media for specifying the value of gift they expect their child to receive. Have you seen the kind of thing? ‘Just to let you know that little Johnny’s party is a very expensive event and I’d like each gift to be worth at least £15 to reflect that.’ Followed by justified social media shaming. I certainly don’t want to look like that, even though I would be trying to specify a low amount. My other worry is that this might still exclude the kids whose parents don’t have enough spare cash to send a fiver. I think the only answer to that is to include a longer explanation like: “Thanks so much for coming to the party! We don’t need any presents, thank you, just your presence. My three boys all have their birthdays around the same time later this spring. I plan to make them fiver parties and see if I can kickstart something that would make a real difference to my pocket and to my storage space. Now read: How do I get out of debt? What do you think? Fiver parties for the future or is this just overthinking it? Have your say using our comments section below.